Five years ago, a group of excited, nervous children, uncomfortable in their spotless uniforms, crowded through the gates of their new secondary schools. At the same time a group of excited, nervous staff and trustees started building Impetus – The Private Equity Foundation out of the merger of two great charities. In the five years since, those children have done a whole lot of learning and growing up and they’re now entering their big GCSE year. Thanks to our work, and the work of our amazing charity partners, many of them who come from disadvantaged backgrounds will have a better chance of succeeding in their exams and their future education and career. And we’ve done our own learning and growing up too. I wanted to use our 5th anniversary as a moment to reflect on and share some of what we’ve learned along the way, not because we have all the answers but because I reckon we have some of the right questions. I hope that by sharing our experience we’ll inspire others to help us answer them. I have four reflections. First, a difficult lesson: building impact is difficult and slow. It’s difficult because it means answering the tough questions. For the leaders and teams of our charity partners, it’s tough making decisions about who to work with and, even tougher, who not to work with. It’s tough to stop bits of your programme that don’t work. It’s tough to add bits to your programme that make it work better but also cost more for funders – like our employment charities who have added in-work mentoring to make sure that young people don’t just get jobs, they keep them. And it’s tough deciding what outcome to aim for because the outcomes that really matter are also the hardest to achieve. And it’s slow because deep change takes time and capability. 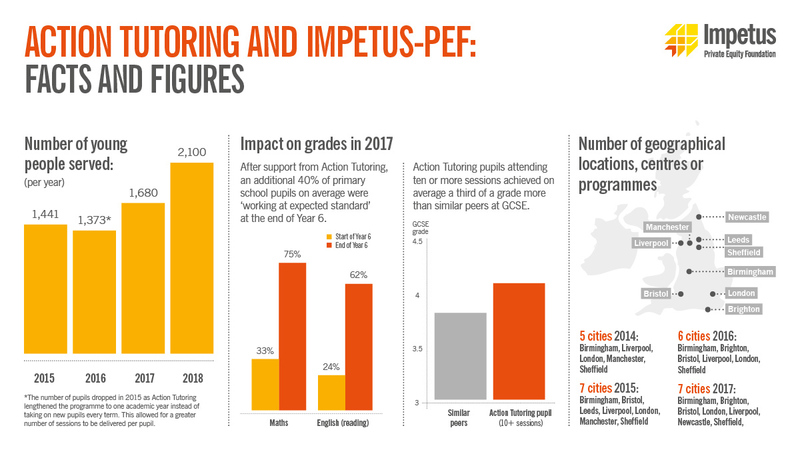 It takes a number of ‘cycles’ to hone an education or jobs programme so that you’re confident it works – so for a tutoring charity it might take years’ worth of exam results, and ongoing tweaking, to have a solid programme. And it takes even longer to build a great organisation that can deliver that programme, and the right results, again and again to growing numbers of young people. Second, an exciting lesson: it’s worth it. We’ve seen that by building deep partnerships with great organisations, giving them long-term funding and lots of support, advice and, yes, challenge, we can deliver amazing results for disadvantaged young people. 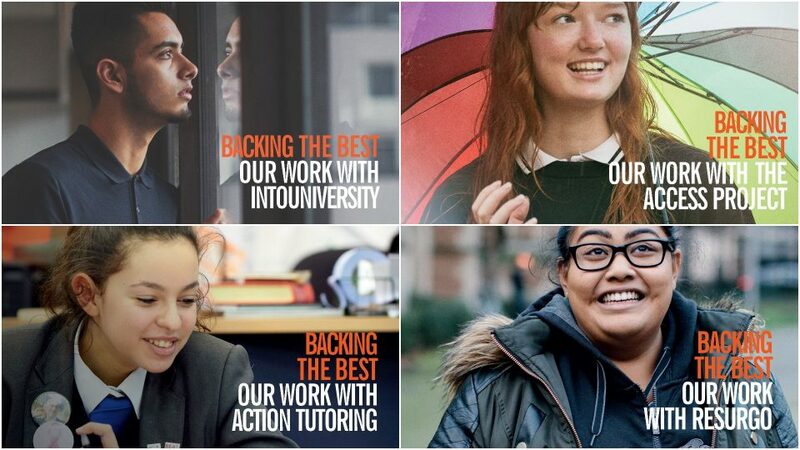 Take IntoUniversity, who support young people from disadvantaged backgrounds to have the choice to go to university. We started working together when they had one centre working with 850 children and, over the ten years of our partnership, they’ve grown to work with 30,000. And, crucially, they’ve grown while maintaining a rigorous focus on quality – with 75% of their young people going on to university, beating the most demanding benchmarks. 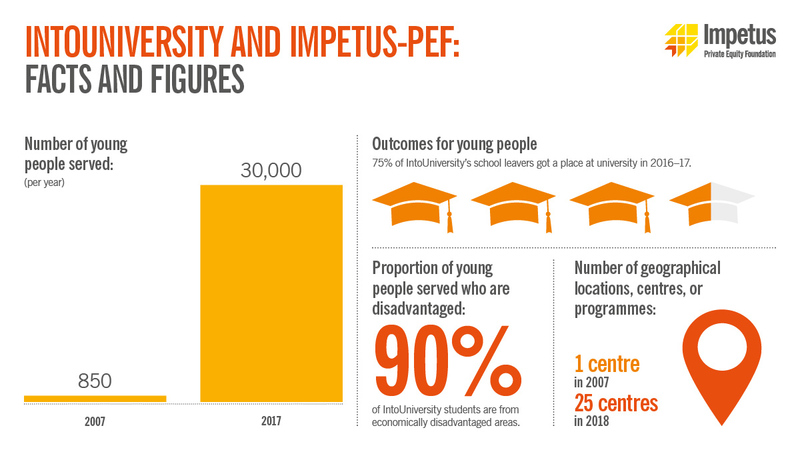 IntoUniversity is our longest partnership (I told you it took a while to build big impact!). 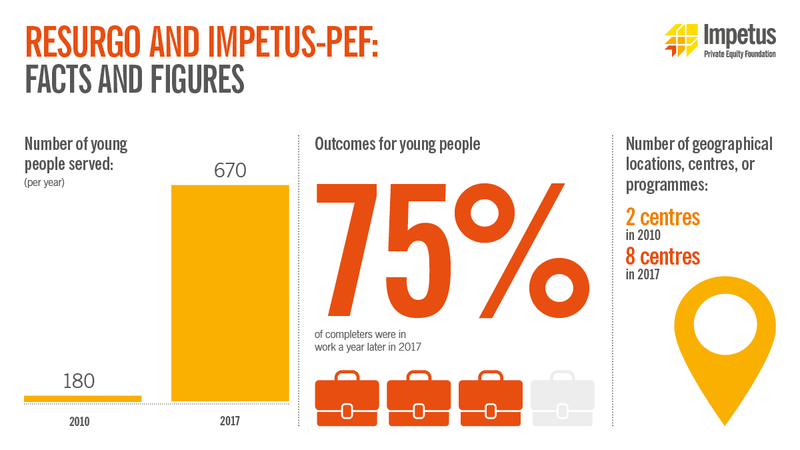 But we can see similar great results from our other long-term partners, like Resurgo who provide world-class coaching to help young people get and keep jobs; The Access Project helping young people from disadvantaged backgrounds get into top tier universities; and Action Tutoring who provide free GCSE tutoring for pupils who can’t afford it. So, it takes time, money and expertise but it pays off. Third, a challenge to our approach: being the best isn’t good enough for charities. We’ve learned that delivering great results for the young people you work with, with rigorous evidence, top notch leadership, and a solid business model isn’t enough to get you the funding you need to grow. The relationship between an organisation’s impact and its revenue is often weak or non-existent, so there’s a danger that the brilliant charities we work with can’t reach everyone who needs their support. So, we’ve learned that we need to work in partnership with other funders, including policy makers, to make sure that money goes where it will do the most good. Fourth, a thank you. The reason we’ve been able to do the difficult and slow work of building impact with our charity partners and been able to get better support to more young people, is that we have amazing, passionate people on our side. 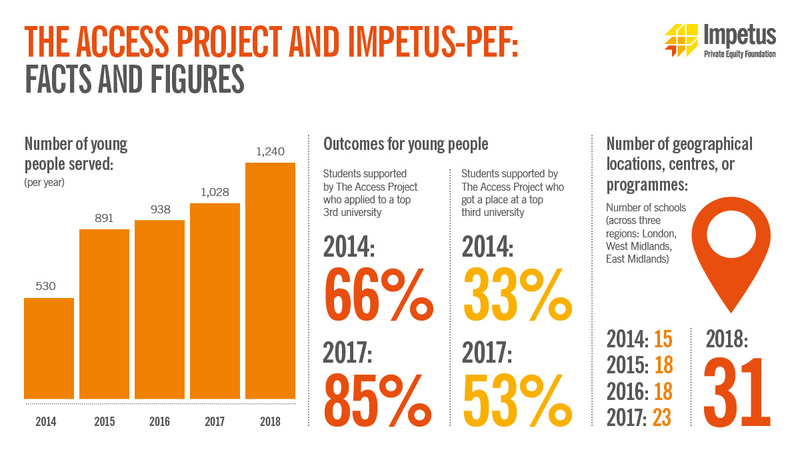 We’ve been able to make long-term commitments because we’ve been backed by patient, long-term funders and pro bono partners who share our belief that building the best for disadvantaged young people takes time but is the way to achieve change that lasts. I hope they can see how much we have been able to achieve with their help. We can’t thank them enough. It’s been a great, challenging, fascinating five years. I’m proud of what we’ve achieved with our charity partners and the difference we’ve made together in the lives of young people across the country. But I’m even more excited about the next five years because I see the potential to do so much more. I see the potential in tens of thousands of young people from poorer families that is the greatest untapped resource our country has. And I see the potential of the amazing charities we work with to get the best support to more and more of them, so that they can succeed in school, in work and in life. If you see it too, whether you’re an employer, a funder, a philanthropist, a charity leader, a political leader, a journalist, or someone brilliant and passionate who wants to join our team; and you care about giving all young people the same chance at success, get in touch and we can unlock that potential together. Andy Ratcliffe is the CEO of Impetus.